“It was his first time on the Tokyo track this morning and he was very concentrated – not looking around – and he felt a little bit strong. “He has good balance and he changes leads without trouble, so I think he can handle the left-handed course. 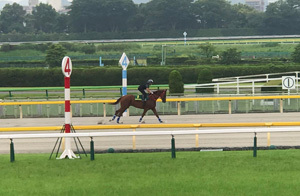 “The horse had a number of gallops after his last start and also finished a barrier trial before being shipped to Japan.